Reconstructed historical factory in Žilina (Slovakia) for production of safety matches. Originally built in 1915 for the business firm Wittenberg and son. The factory system is a method of manufacturing using machinery and division of labour. Because of the high capital cost of machinery and factory buildings, factories were typically privately owned by wealthy individuals who employed the operative labour. Use of machinery with the division of labour reduced the required skill level of workers and also increased the output per worker. The factory system was first adopted in Britain at the beginning of the Industrial Revolution in the late 18th century and later spread around the world. It replaced the putting-out system. The main characteristic of the factory system is the use of machinery, originally powered by water or steam and later by electricity. Other characteristics of the system mostly derive from the use of machinery or economies of scale, the centralization of factories, and standardization of interchangeable parts. The factory system is considered a form of production. The operative labour generally does not own a significant share of the enterprise. The capitalist owners provide all machinery, buildings, management and administration, raw or semi-finished materials and are responsible for the sale of all production, as well as any resulting losses. Use of unskilled labour – Before the factory some systems had many products such as shoes and muskets were made by skilled craftsmen who usually custom-made an entire article. In contrast, factories practiced division of labour, in which most workers were either low skilled labourers who tended or operated machinery, or unskilled labourers who moved materials, semi-finished and finished goods. There were a few skilled mechanics. Division of labour was also practiced by the putting out system in which, for example, pieces of leather were cut off-site and brought to a central shop to be made into shoes or other articles. Economies of scale – Factories produced products on a much larger scale than the putting out or crafts systems. Because factories could oversupply local markets, access to transportation was important so that goods could be widely distributed. Factories used far less manpower per unit of production and therefore lowered product cost. Location – Before the widespread use of steam engines and railroads, most factories were located at water power sites and near water transportation. Railroads became widespread (itself a consequence of steam power becoming more efficient and affordable), so factories could be located away from water power sites but nearer railroads. Centralization – The cost and complexity of machinery, especially that powered by water or steam, was more than cottage industry workers could afford or had the skills to maintain. The exception was the sewing machine, which allowed putting out of sewing to continue for decades after the rise of factories. Home spinning and weaving were displaced in the years following the introduction of factory production, especially as distribution became easier. Workers and machines were brought together in a central factory complex specially designed to handle the machinery and flow of materials. Although the earliest factories were usually all under one roof, different operations might be done on different floors. (Multi-story buildings were common because they facilitated transmission of power through line shafts.) In large factories, such as Baldwin locomotive works, different processes were performed in different buildings. Foundry and blacksmith operations were normally kept in a separate building for reasons of safety, cleanliness and health. The efficiency of steam engines increases with size. Because of this, the smallest steam engines were about 2 horsepower, which was larger than needed by most workshops. Consequently until electrification in the 1910s and 1920s most workshops relied on manual power or rented space in power buildings which provided a centrally powered line shaft. Standardization and uniformity – Components were made to standard specifications, such as soles, heels and uppers for shoes themselves made to uniform sizes. Uniformity was mainly due to the precision possible from machinery, but also, quality was overseen by management. The quality of many machine operations such as sewing was superior to hand methods. Near the end of the 19th century metal interchangeable parts became widely used. Guarantee of supply – Factories were able to produce and distribute a steady supply of goods. Workers were paid either daily wages or for piece work, either in the form of money or some combination of money, housing, meals and goods from a company store (the truck system). Piece work presented accounting difficulties, especially as volumes increased and workers did a narrower scope of work on each piece. Piece work went out of favor with the advent of the production line, which was designed on standard times for each operation in the sequence, and workers had to keep up with the work flow. One of the earliest factories was John Lombe's water-powered silk mill at Derby, operational by 1721. By 1746, an integrated brass mill was working at Warmley near Bristol. Raw material went in at one end, was smelted into brass and was turned into pans, pins, wire, and other goods. Housing was provided for workers on site. 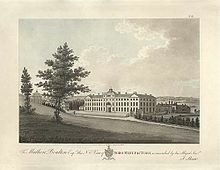 Josiah Wedgwood in Staffordshire and Matthew Boulton at his Soho Manufactory were other prominent early industrialists, who employed the factory system. The factory system began widespread use somewhat later when cotton spinning was mechanized. The first use of an integrated system, where cotton came in and was spun, bleached dyed and woven into finished cloth, was at mills in Waltham and Lowell, Massachusetts. These became known as Lowell Mills and the Waltham-Lowell system. The Nasmyth, Gaskell and Company's Bridgewater Foundry, which began operation in 1836, was one of the earliest factories to use modern materials handling such as cranes and rail tracks through the buildings for handling heavy items. Cromford mill as it is today. Richard Arkwright is the person credited with being the brains behind the growth of factories and the Derwent Valley Mills. After he patented his water frame in 1769, he established Cromford Mill, in Derbyshire, England. The factory system was a new way of organizing labour made necessary by the development of machines which were too large to house in a worker's cottage. Working hours were as long as they had been for the farmer, that is, from dawn to dusk, six days per week. Overall, this practice essentially reduced skilled and unskilled workers to replaceable commodities. Mass production using interchangeable parts was first achieved in 1803 by Marc Isambard Brunel in cooperation with Henry Maudslay, and Simon Goodrich, under the management of (with contributions by) Brigadier-General Sir Samuel Bentham, the Inspector General of Naval Works at Portsmouth Block Mills at Portsmouth Dockyard, for the British Royal Navy during the Napoleonic War. By 1808 annual production had reached 130,000 sailing blocks. [page needed][page needed][page needed][page needed][page needed] This method of working did not catch on in general manufacturing in Britain for many decades, and when it did it was imported from America, becoming known as the American system of manufacturing, even though it originated in England. Much manufacturing in the 18th century was carried out in homes under the domestic or putting-out system, especially the weaving of cloth and spinning of thread and yarn, often with just a single loom or spinning wheel. As these devices were mechanized, machine made goods were able to underprice the cottagers, leaving them unable to earn enough to make their effort worthwhile. Other products such as nails had long been produced in factory workshops, increasingly diversified using the division of labour to increase the efficiency of the system. Factory workers typically lived within walking distance to work until the introduction of bicycles and electric street railways in the 1890s. Thus the factory system was partly responsible for the rise of urban living, as large numbers of workers migrated into the towns in search of employment in the factories. Many mills had to provide dormitories for workers, especially for girls and women. The transition to industrialisation was not without difficulty. For example, a group of English workers known as Luddites formed to protest against industrialisation and sometimes sabotaged factories. They continued an already established tradition of workers opposing labour saving machinery. Numerous inventors in the textile industry such as John Kay and Samuel Crompton, suffered harassment when developing their machines or devices. The Soho Manufactory in 1800. In other industries the transition to factory production was not so divisive. Until the late 19th century it was common to work 12 hours a day, six days a week in most factories; however long hours were also common outside factories. Debate arose concerning the morality of the system, as workers complained about unfair working conditions prior to the passage of labour laws. One of the problems concerned women's labour; in many cases women were paid almost a quarter of what men made. Child labour was also a major part of the system, and was vehemently argued by those who deemed it immoral. However, in the early 19th century, education was not compulsory and in many families having children work was necessary due to low incomes (Samuel Slater employed children but was required to provide basic education). Children commonly did farm labour and produced goods for the household. Besides working in factories children worked in mines. Automation in the late 19th century is credited with displacing child labour, with the automatic glass bottle blowing machine (ca. 1890) cited as an example, having been said to do more to end child labour than child labour laws. Years of schooling began to increase sharply from the end of the 19th century. Some industrialists themselves tried to improve factory and living conditions for their workers. One of the earliest such reformers was Robert Owen, known for his pioneering efforts in improving conditions for workers at the New Lanark mills, and often regarded as one of the key thinkers of the early socialist movement. Karl Marx worried that the capitalist system would eventually lead to wages only sufficient for subsistence due to the tendency of the rate of profit to fall. Subsistence wages were indeed the case in parts of England. The British Agricultural Revolution had been reducing the need for labour on farms for over a century and these workers were forced to sell their labour wherever they could. Conditions were particularly bad during the depression years of the late 1830s to early 1840s. The depression was immediately followed by the Irish famine of 1845–50 which brought large numbers of Irish immigrants to seek work in the English and American factories. One of the best known accounts of factory workers’ living conditions during the Industrial Revolution is Friedrich Engels' The Condition of the Working Class in England in 1844. By the late 1880s Engels noted that the extreme poverty and lack of sanitation he wrote about in 1844 had largely disappeared. ^ Walker 1993, pp. 187–88. ^ a b c Thomson, Ross (1989). The Path to Mechanized Shoe Production in the United States. Chapel Hill and London: The University of North Carolina Press. ISBN 978-0807818671. ^ a b c Hunter, Louis C.; Bryant, Lynwood (1991). A History of Industrial Power in the United States, 1730–1930, Vol. 3: The Transmission of Power. Cambridge: MIT Press. ISBN 0-262-08198-9. ^ Taylor, George Rogers (1951). The Transportation Revolution, 1815–30002. New York, Toronto: Rinehart & Co. ISBN 978-0-87332-101-3. ^ * Nelson, Daniel (1980). Frederick W. Taylor and the Rise of Scientific Management. Madison: University of Wisconsin Press. ISBN 0-299-08160-5. ^ Musson; Robinson (1969). Science and Technology in the Industrial Revolution. University of Toronto Press. pp. 491–5. ^ Enlightenment & measurement, UK: Making the modern world . ^ Portsmouth dockyard, UK . ^ "Block", Collections (exhiblet), UK: Science museum . ^ Gilbert, KR (1965), The Portsmouth Block-making Machinery, London . ^ Cooper, CC (1982), "The Production Line at Portsmouth Block Mill", Industrial Archaeology Review, VI: 28–44 . ^ Cooper, CC (1984), "The Portsmouth System of Manufacture", Technology and Culture, 25: 182–225 . ^ Coad, Jonathan (1989), The Royal Dockyards 1690–1850, Aldershot . ^ Coad, Jonathan (2005), The Portsmouth Block Mills : Bentham, Brunel and the start of the Royal Navy’s Industrial Revolution, ISBN 1-873592-87-6 . ^ Wilkin, Susan (1999), The application of emerging new technologies by Portsmouth Dockyard, 1790–1815 (PhD Thesis), The Open University (copies available from the British Thesis service of the British Library). ^ Cantrell, J; Cookson, G, eds. (2002), Henry Maudslay and the Pioneers of the Machine Age, Stroud . Walker, William (1993). "National Innovation Systems: Britain". In Nelson, Richard R. (ed.). National innovation systems : a comparative analysis. New York: Oxford University Press. ISBN 0195076176.